There is a great temptation in life and at work to over think, over analyze and get totally wrapped around the axle. I am currently trying to make it simpler. It's remarkable what a large percentage of our advice at Y Combinator is either "Just tell them" or "Just ask them." Since the topic of state-employed, union-member compensation and benefits are front and center these days, here in NJ and elsewhere, I thought I'd link to this excellent excerpt from and email posted by Misch over here. "It is the purest definition of a corrupt process to force membership in any group hired by government and then, in any way, manner, shape or form, use involuntarily collected funds of that group to influence a political process that literally picks the taxpayer's pocket. I am not writing this as an indictment of the great majority of fine educators. I am, however, writing this as an absolute indictment of the political, self-aggrandizing corruption and whining of those who do, indeed, disgrace the profession. We need to drop most of the pretense of bigger paychecks and benefits "for the children"." I have a ton of respect for teachers. I hate to see any contract, originally agreed to by both sides, overturmed. The other option is really bad at some junctures, this being one of them. Groupthink - the new good thing? There is going to be, in my opinion, a lot of energy devoted to monetizing this concept. So the idea is that if everybody piles into the same trade at the same time it is more likely to work? That is sure for sure. It is also not the point at a lot of times, though it mimics technical analysis as it honors the idea that the "collective crew might know more than me". There is a fine line in here between missing what others know and being the last to do what others have done. Or are doing en masse. I want to follow up on this tomorrow. Here's the follow up. Of course any trade is more likely to work if lots of people put it on at the same time. 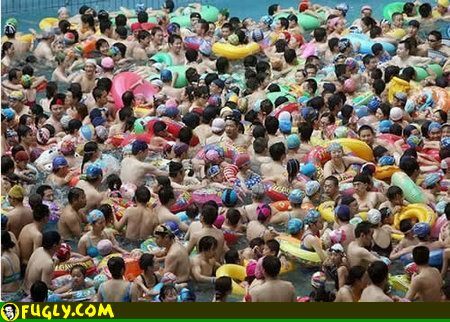 Any trade is almost guaranteed to work if 100 people put it on at the same time. In the short term. The trickier thing is what happens when the group thinkers want to go the other way. Everybody can't close positions at the same time. I would not IM you. This is eerily similar to the AT&T iPhone, a smallish touch screen tablet that doesn't make phone calls. Giving it away selling it for $99 bundled with a PC or laptop might mean that sales will be only somewhat disappointing. I'm betting on Samsung being #2 in the tablet space over time. Michael Dell apparently has some other ideas. He bought 10 million shares last week. 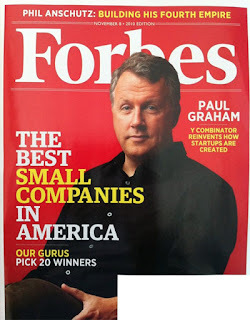 Is he preparing a run at taking Dell private, or does he know something that I don't know? Looks to me like a big fund was liquidating. Not sure though. "Our vision is to provide seamless, secure, context-aware experiences for a connected world." Big HP strategy event yesterday. The above is what the new CEO came up with after a few months on the job. Some earnings growth might be a seamless place to start. 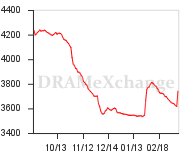 DXI DRAM price Index from DRAMexchange. Asia spot prices for computer memory are going up in a hurry this morning, obviously over supply disruptions in Japan. http://goo.gl/NtXBl DRAMexchange does a good job in times of market dislocation. I'm surprised they even opened the market this week. That question in the title could be in response to a standard investment assertion, "You need to do your own work." CCME looks like a fraud. (Roddy Boyd did some great work here.) It might not be a fraud, but I met with the company in late 2009 and it had a certain toogoodtobetrue feeling to it. There is more bad news out today. On the face of it, this play on Chinese in-transit advertising could have been a great investment. The growth rates and returns were fabulous. The stock wasn't that expensive, there was a liquid ADR which made buying this no more difficult than buying shares in Microsoft. Now the stock, which has been halted since last week, looks like it may have made $400+ million in market cap vanish. The guy getting credit for revealing the fraud actually did a lot of work that is not remotely possible for the average retail investor, or even the extraordinary retail investor, including going to China to meet the company. Fast-growing China plays are still very much a hot area. Investing in them as an individual requires an extra dose of caution, and a smaller position, if doing so when you're not in a position to ascertain whether there's any there there. 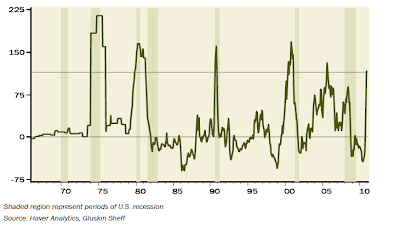 In that chart right to the left, David Rosenberg of Gluskin Sheff points out that oil prices have gone up a lot, and that in some instances in the past when this happened, a recession ensued. I was never a fan of Rosenberg but I'm not attacking his work or logic. I am also not a fan of the current macro/market debate. 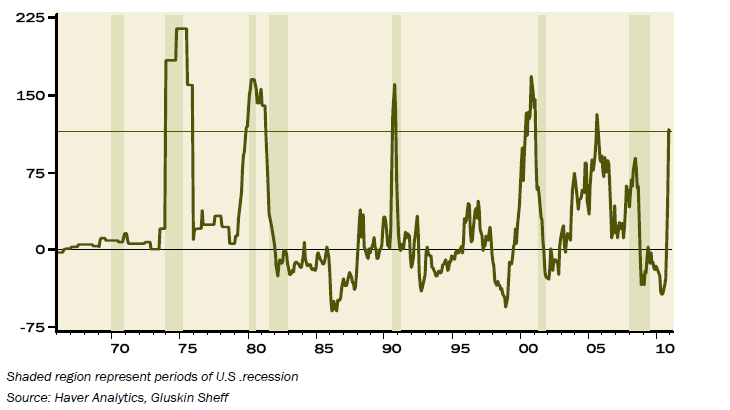 On the blog where I first saw this chart, the comments section was unreadable. Everybody has an opinion about why we are here, where we are going, and it feels like it's less fact-based than ever. See how I didn't give you my opinion on oil prices? The Spring Ahead nonsense is nonsense.